I’m pulling together a number of bits and bobs for you, and remember, I’m very happy to see you during study leave if you want to look in. 🙂 If you were timetabled for Media, I should be available… and we have a kettle. 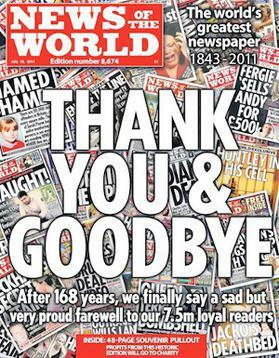 What were Murdoch/News of the World‘s PURPOSE(s) in running the stories they did? When did they ‘step over the line’? How would the illegal hacking affect peoples’ ATTITUDES and BEHAVIOURS? Which audience NEEDS were the newspapers fulfilling? Did the Press Complaints Commission (Archive of PCC site HERE) fail in its duty to regulate the News of the World? Remember, as well, that some of the historic events outlined in the documentary and the subsequent Leveson Inquiry into the “culture, practices and ethics of the British press” are still ‘live’ and ongoing. I highly recommend you take time to watch it with your documentary heads on. Consider the use of archive footage, music, and my own personal favourite, the dramatic low key lighting in the interviews to make it appear more clandestine. The documents we will be working from on Monday and Tuesday are on THIS PAGE. You will not manage to read all of them, but you should be able to use an index to find the relevant sections when we start discussing what we should and/or can report. If you read nothing else, read the NUJ Code of Conduct! The next post will have all the docs you will need for your product! Set your timers,it should be along in about 15 minutes. Put the kettle on.